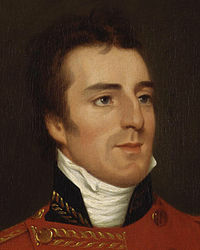 Bhí Arthur Wellesley, an chéad díuc Wellington (1 Bealtaine, 1769 - 14 Meán Fómhair, 1852) ar dhuine de na saighdiúirí agus státairí ba thábhachtaí sa mBreatain i rith na naoú haoise déag. In Éirinn a rugadh é (ag 29 Sráid Mhuirfean Uachtarach i mBaile Átha Cliath, an óstán Merrion inniu), de mhuintir cháiliúil den Uaisle. San arm, chaith sé tamall ina aide-de-camp do dhá Lord Lieutenant in Éirinn. Toghadh é ina fheisire i bParlaimint na hÉireann. Throid Wellesley san Ísiltír agus san Ind, i gCath Seringapatam sa gCeathrú Cogadh Anglo-Mysore. Déanadh gobharnóir ar Seringapatam agus ar Mysore de ina dhiaidh sin. Tharraing Wellesley cáil air féin mar ghinearál i leithinis na Spáinne agus na Poirtingéile i rith chogaidh Napoleon. Tugadh grád marascal machaire (field marshall) dhó tar éis buanna in aghaidh na Fraince ag Cath Vitoria in 1813. Tar éis dhíbirt Napoleon in 1814, chaith sé tréimhse ina ambasadóir chun na Fraince. Déanadh Diúc de. Bhí sé i gceannas ar an arm a bhuail Napoleon ag Cath Waterloo sa bhliain 1815. Chaith Wellesley dhá thréimhse ina phríomh-aire leis na Tóraithe, ar dtús idir 1828-30 agus arís in 1834. Ba ea Wellesley a bhí ina phríomh-aire le teacht Fuascailt na gCaitliceach i 1829. Bhí Wellesley ina phríomh-cheannasaí ar arm na Breataine go dtí gur cailleadh é in 1852. Tugadh an leathanach seo cothrom le dáta an 29 Aibreán 2017 ag 14:53.